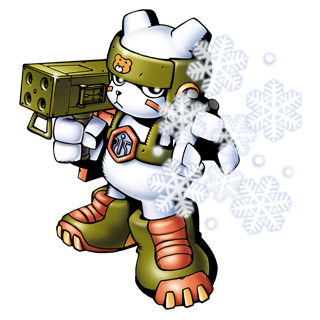 A Digimon that possesses power over Ice which bears the might of one of the legendary Ten Warriors. 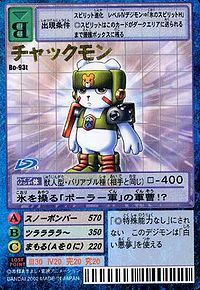 It styles itself as holding rank as a member of a polar army's polar region defense force. Since it replies that the matter's top secret if you ask anything about it, the truth is unknown. It's thought to be largely something it dreamed up. However, its operation of the Launcher it carries (nicknamed Romeo) and its precision conduct in battle are genuine, and its survivalist knowledge also has a strong, truly reliable existence. Since it rarely acts of its own volition, it primarily operates in response to someone's requests or orders. It will have nothing to do if nobody is relying on it, and is likely to worry about its purpose in life and get completely depressed. 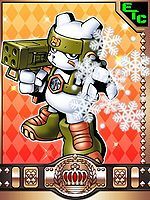 The shots fired from its Launcher are special snowballs, so there are several varieties according to purpose. 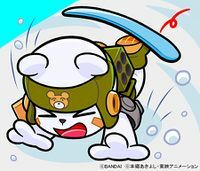 Its Special Moves are taking the shape of an icicle and pouncing at the opponent (Tsurararara~), and blindly firing supercooled snowballs from the Launcher (Snow Bomber). Title: 「氷の人闘士」 — "Human Warrior of Ice"
Possibly a misspelling of 'chuck', which is short for chuckle 「チャックル Chakkuru」. From chakuhyou (「着氷」), meaning ice accretion. 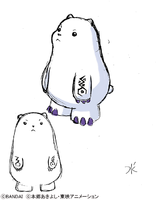 From shirokuma (「白熊」), kanji for polar bear. | Kuma (熊) means bear. 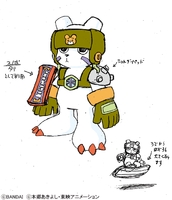 Chackmon's teddy bear symbol is an homage to screenwriter Chiaki J. Konaka, according to both Konaka himself and a post on the Digimon Web Twitter account. 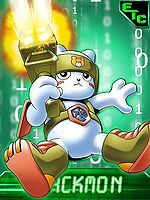 During his youth, Konaka and his brother made the movie Kuma-Chan (1992); the titular bear from that movie has been described by Konaka as the brothers' symbol and "calling card", and the symbol was present on Konaka's business card at the time of Chackmon's creation. 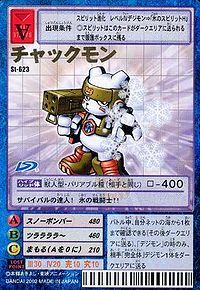 スノーボンバー Sunō Bonbā Blizzard Blaster/Ice Bomber Fires ice balls out of Romeo. 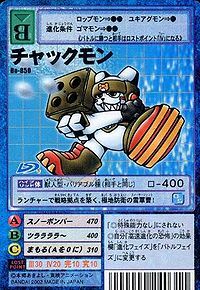 Tsurara Lala  Icicle Lala ツララララ～ Tsurara rara Frozen Tundra/Tsulalalala Transforms its body into an icicle and flies into an enemy, or transforms into a patch of ice spikes that can stick to surfaces. Attacks with its hard, ice-covered fist. 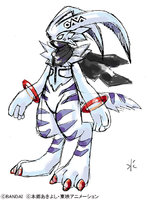 Its body transforms into an icicle shape and falls down from the sky. Wearing its skis, it does a V-shaped jump and assaults the opponent. Freezes the opponent's feet with its breath, then hits them with an icy uppercut. 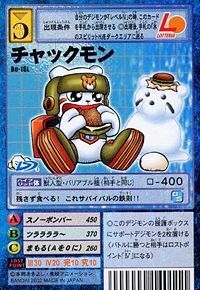 Kachikachi Kocchin  Frozen Clinking カチカチコッチン N/A Crystal Freeze Breaths out a blizzard. Chackmon fighting in the fire area of Sephirothmon. 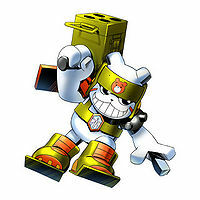 Himi Tomoki becomes Chackmon when he spirit evolves with the Human Spirit of Ice. The Five Warriors Annihilated!? Terrifying Dark Power! 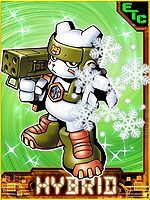 By using a Spirit of Ice on a Patamon or Angemon, it will immediately evolve into Chackmon in the next battle it enters. 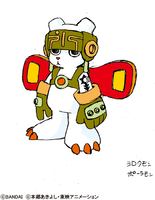 Chackmon is a playable character in this game where it can slide evolve to Blizzarmon or Ancient Megatheriumon. Chackmon appears as the enemy on the Sparkly Ice Park level. Chackmon's alternate colouration is yellow. 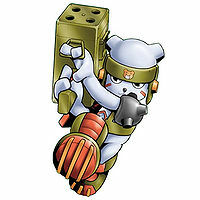 Chackmon is available as a Digimon Medal. An expert at survival! The combat warrior of ice!! 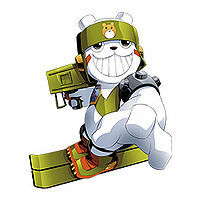 This snow sergeant protects the polar regions, securing strategic positions with its launcher! 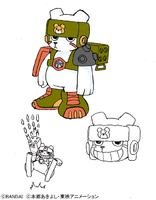 The ice manipulating sergeant of the 'Polar Troops'!? It eats leaving nothing behind! This is the unbreakable rule for survival!! An evolution achieved with the Human Spirit that holds the power of the Warrior Ten of Ice. 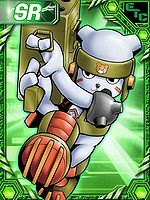 Though it claims to hold a rank in a likely made-up organization, it nevertheless is capable of handling its launcher with great precision, and possesses a wealth of survival knowledge. 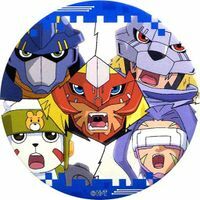 Chackmon's bear symbol on its helmet was inspired by a bear's design on an anime production staff's business card, who is likely to be Chiaki J. Konaka, the lead writer of Digimon Tamers. 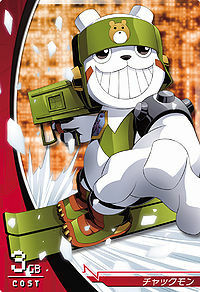 The name Chackmon was also derived from his name. 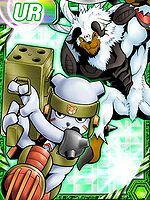 ↑ 9.0 9.1 Digimon Frontier: "Bullying is Unforgivable! 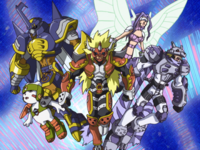 Evolve, Chackmon of Ice"
↑ Digimon Frontier: "The Five Legendary Warriors Annihilated!? Terrifying Dark Power!"